I have been a recruiter for more than seven years, and I take great pride in what I do because I know that I have helped to change people’s lives for the better. It’s an amazing feeling, and the satisfaction you get doesn’t get much better. But at the same time, I am well aware of the huge responsibility we have toward our candidates who did not make the final cut. 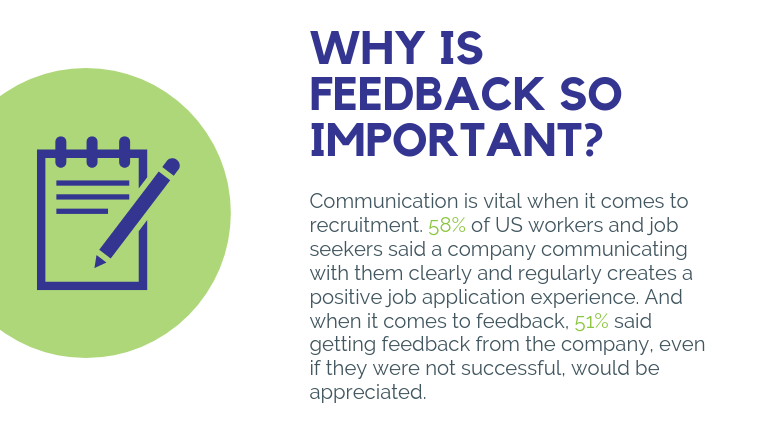 Communication is vital when it comes to recruitment. In fact, when asked what would constitute a positive job application experience, 58 percent of US workers and job seekers said a company communicating with them clearly and regularly. And when it comes to feedback, 51 percent said getting feedback from the company, even if they were not successful, would be appreciated. Recruiters should always provide feedback to candidates, especially those who are unsuccessful. Any feedback, irrespective of its type, has value. So, even if you feel hesitant about sharing negative feedback, you should understand that by denying it, you are not giving candidates the opportunity to improve. Feedback can leave a lasting impression on people, whether good or bad. Some people shy away from providing feedback if it is negative for fear of it coming across as criticism, however, you should always give it. Not only will it allow the individual to improve, but it will also strengthen your relationship with the candidate. Building relationships is vital in talent acquisition. Just because someone isn’t suitable for one role, doesn’t mean they’ll be unsuitable for other roles in the future. When you share feedback you also create a rapport with the candidate. This means they are more likely to keep in touch to find out about future roles. Finding the best talent is tough at the best of times, but throw in a global skills shortage, and it’s even harder. You need to provide good candidate experiences so that you will be able to proactively stock your talent pipeline so building relationships with prospective candidates is a must. As a recruiter, one of the toughest parts of the job is to manage human expectation, which in itself, is very challenging. So, the best way to deal with it is to stay true to yourself and to your candidates. Keep them informed about every step and you will be able to expect the same from them. It’s about building trust and this works both ways. Last but not least, when you share feedback you are representing your employer. If you provide honest and constructive feedback, the candidate is more likely to hold you in high regard even if they are unsuccessful. If you take the time to acknowledge their efforts and offer constructive support that will enable them to improve in subsequent interviews, they will become advocates for your business. If you don’t, you run the risk of the candidate posting negative reviews on social media. Remember, not everyone is going to be very receptive to feedback and their frustration might well come across but don’t take it personally. Bhaskar Bhattacharya is a Recruitment Consultant at WilsonHCG.